Last week, the Walters Art Museum in Baltimore put on display a little-known but extraordinary nineteenth-century prayer book woven entirely from silk on a Jacquard loom. 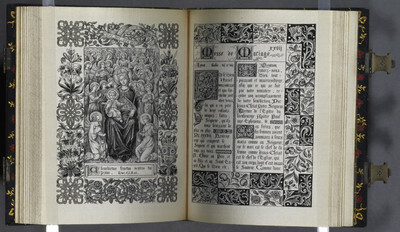 In Woven Words: Decoding the Silk Book, visitors can get a close look at this unique objet d’art. “It survives today as the only successful example of an entirely woven book, every line of text and saintly figure intricately created out of silk,” said Lynley Anne Herbert, Robert and Nancy Hall Associate Curator of Rare Books and Manuscripts. It was Joseph Marie Jacquard of Lyon, France, who patented a weaving technique that revolutionized the textile industry with his mechanized loom. 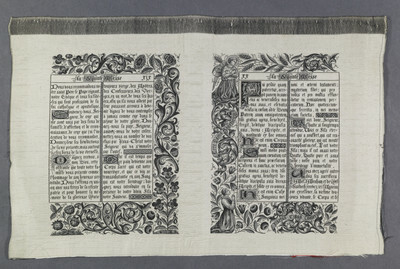 Jacquard’s innovation presaged the modern computer in its use of paper punch cards that could be programmed to allow complex patterns, like those seen in the Silk Book. The Silk Book in on view through April 28. Last week, the Walters Art Museum in Baltimore put on display a little-known but extraordinary nineteenth-century prayer book woven entirely from silk on a Jacquard loom. In Woven Words: Decoding the Silk Book, visitors can get a close look at this unique objet d'art. "It survives today as the only successful example of an entirely woven book, every line of text and saintly figure intricately created out of silk," said Lynley Anne Herbert, Robert and Nancy Hall Associate Curator of Rare Books and Manuscripts. It was Joseph Marie Jacquard of Lyon, France, who patented a weaving technique that revolutionized the textile industry with his mechanized loom. Jacquard's innovation presaged the modern computer in its use of paper punch cards that could be programmed to allow complex patterns, like those seen in the Silk Book. "What's remarkable about the Silk Book is that, though it's an object that is more than a century old, it has real connections to our modern-day life," said Julia Marciari-Alexander, Andrea B. and John H. Laporte Director. "We hope that it will continue to inspire our visitors to think about other ways in which art and science converge in their lives."